Unlock the power of Google Analytics reporting. Use the customization available to answer your business questions. Empower yourself to investigate the valuable strategic data regarding the online portion of your business. Each of the reports above can be customized to suit your needs. The reports contain a set of preset reporting dimensions (groupings) and metrics (measurements). These reports are displayed within a common interface that allows you to customize the information displayed in the report. The screen shot below demonstrates controls that exist on all reports. We will explain the four customizations below; date, segment, metric and groupings. The date selection allows you create custom date ranges of your choice. You can analyze an individual day or several months worth of data. You can also compare one time period to another. The screen shot below indicates how to move forward or back through the months of data. You can also set a custom date range or choose for a list of preset data ranges (yesterday, last week, last month, etc). You are also able to compare given time periods. Use the check box on the left of Compare to to initiate this comparison. The date selection tool is very flexible and easy to use. You can segment or filter the data included within a report by clicking the All Users box. Once selected a list of segments appears. 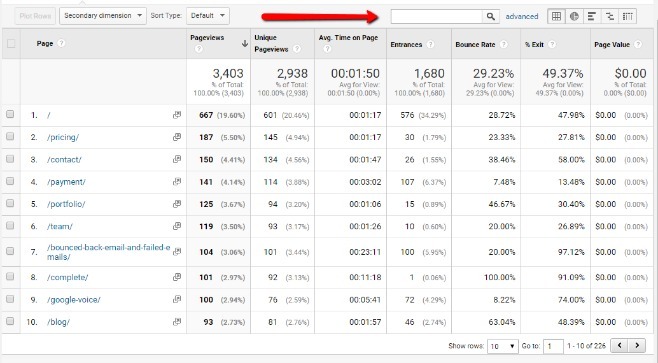 You can filter your report by one or many of these segments such as; direct traffic, mobile traffic, organic traffic, paid traffic, referral traffic, single user sessions, etc. Once you have completed your selection(s), click the Apply button. The metric that is graphed on each report can be changed. 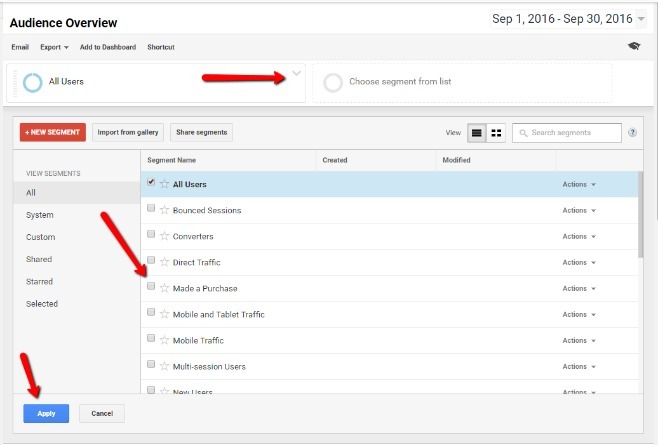 In the example below the default metric for the Audience Overview report is Sessions. However you can change the graph to display a different metric such as; % New Sessions, Avg. 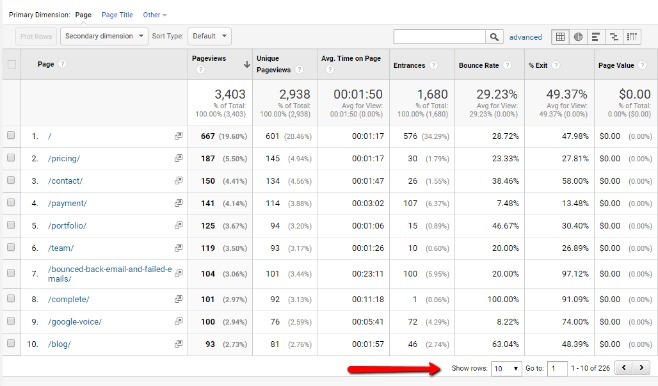 Session Duration, Bounce Rate, Pages/Session, Pageviews and Users. By changing the metric display, you can get a new perspective on the report. You can also customize the time period displayed on the graph by using the selector on the right. By default the report will display by Day but you can also display the data by Hours, Weeks or Months. The graph below shows the number of sessions by hour. As you can see with a longer date range this graph is not too meaningful. The hourly selection is best used for a date range of 1-3 days. An hourly graph will show you what time of day your visitors are viewing your website. You will be able to answer questions like – Is my site most busier at noon or in the evening? . The weekly graph can demonstrate fluctuations in traffic week by week. If you are looking for trends in your traffic, we recommend the monthly view. This will allow you to analyze your traffic over several months. The graph below shows us the number of sessions for the 3-month period (August, September and October) is relatively constant. The monthly display can easily demonstrate changes in seasonal traffic year over year. There are three more customizations available within the preset Analytic Reports that we will discuss; secondary dimension, text search, and page length. Each report is created with a prime dimension, however you have the ability to add an additional dimension to the report. Let’s use the Channel report for our example. The channel report summarizes the traffic sources for your website. The report below shows that a majority of the traffic from this website is organic (48%) but this site also receives 5% of its traffic from social networks. By using the Secondary dimension drop down, you are able to choose from 100s of additional dimensions. Listed within the red outline are the 8 major categories for your selection. Each of these categories contains a list of many more dimensions. For example purposes, we have chosen Device Category as our second dimension. This report will now allow us to review the engagement of our website visitors using certain devices. We can see from the report that a majority of our organic sessions are viewed from a desktop device but we can also see that nearly 7% of our visitors are finding us through mobile search. 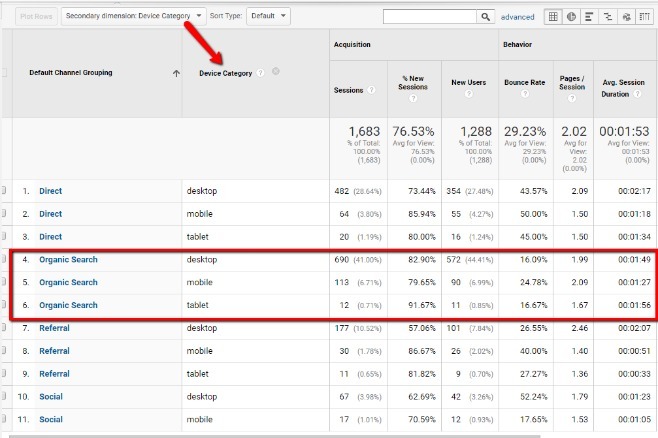 We can also tell from this report that our mobile visitors are viewing the most content at 2.09 pages/session but our tablet visitors have the longest average session duration of nearly 2 minutes. The text search box is always available above the report data. Use this text box to search for specific words or content that is found within your dimension. This search will allow you to filter the report by the given text field. 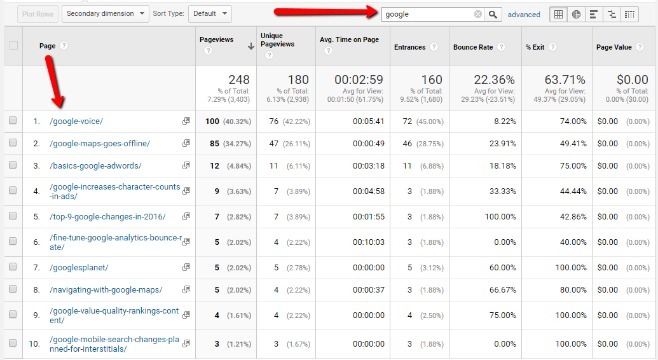 One of the most useful places to use this search is while reviewing the your top page content report. Here is a search for all the Google posts found on the website. Now we are able to evaluate which post is the most engaging, which post received the most traffic, etc. This is a very useful way to create a subset of your reports. By default Google will show the first 10 lines of any report, however you can change the page length up to a maximum of 5,000 lines of data. Generally, I find increasing the page length to 100 or 250 is sufficient. Use the indicator at the bottom of the page and select from the preset page length list. By adjusting the Show Rows value to 25, we can now see the initial 25 rows of the report. We can use the pagination arrows to look at the remaining 200 rows of data. As you can see from these few examples, Google has provided you with an extremely useful analytic interface that provides you with extensive information about your website traffic. 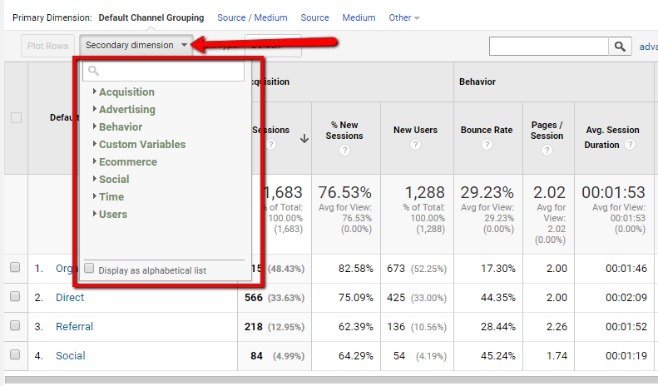 Google Analytics also allows you to customize the reporting to best benefit your business’s analysis. By digging a little deeper into the Google reports, you will be able to gain the insight necessary to grow your business. 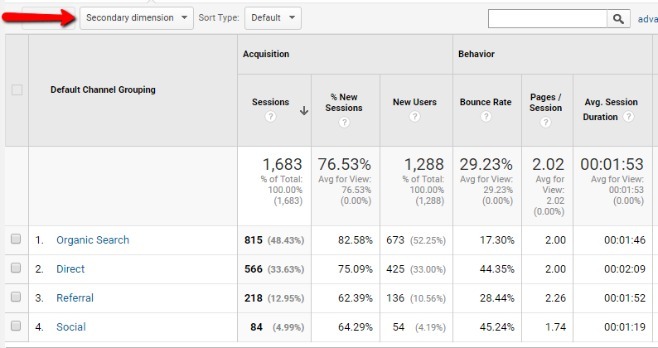 Google Analytics – Many Answers – Learn how to use Google Analytics reporting to answer the important business questions. 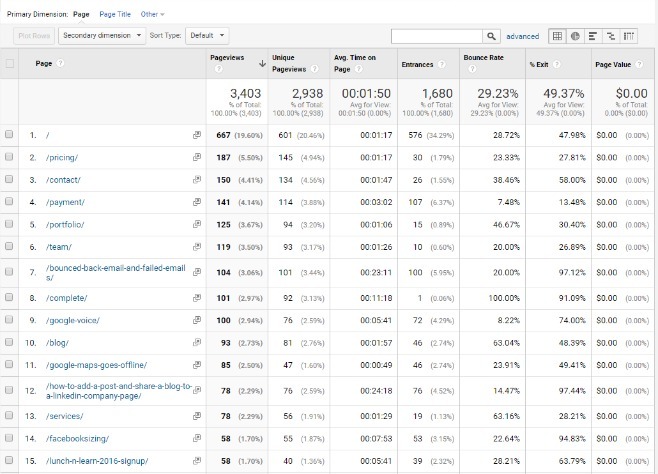 Google Analytics – What Are Metrics?